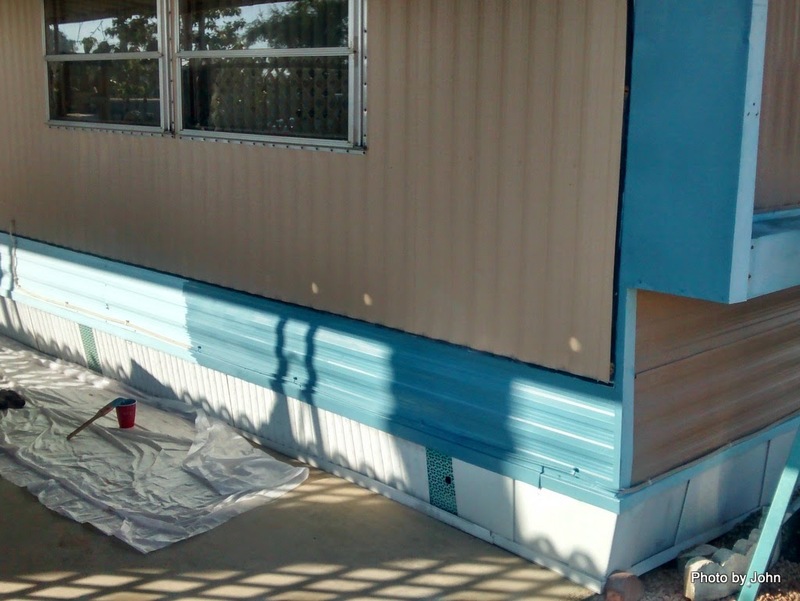 Last Saturday was national Make A Difference Day although I didn't know that when I volunteered to join a small group from the church to paint a couple manufactured homes. They were hoping for 20 volunteers but ended up with about half that many. Since I'd just started my own roofing project the day before I almost bailed on them, but I'm glad I didn't. 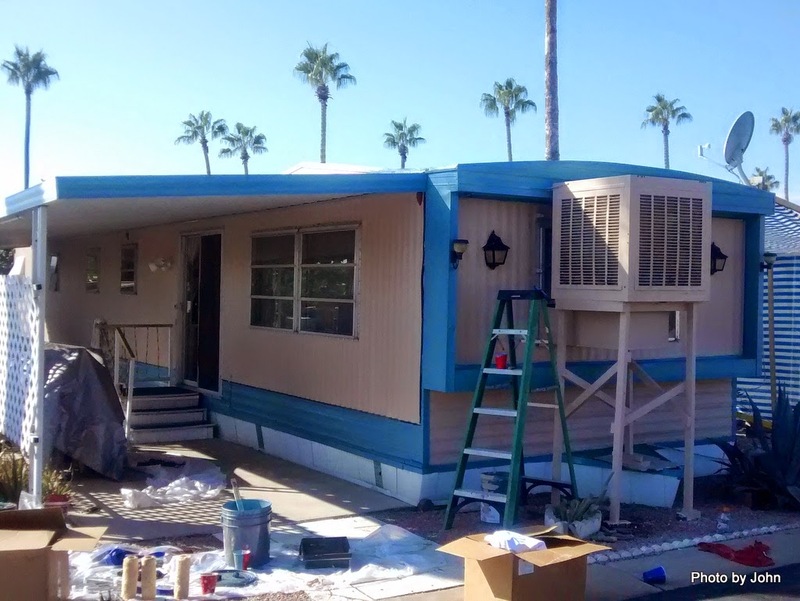 The first home went from white to tan for the main color, with blue trim. The group started by masking the windows, but I could cut in the edges as fast as a person could mask, so I ended up with my trim brush in hand all day - fine by me, and easier for everyone! This place looked much nicer when we got all finished up. This one had fairly complex trim and an additional room built on the back corner. We started painting about 7 a.m. and were finished with it about 11 a.m. or so. A rep from Rebuilding Together came out just about the time we got the first home finished up and took some pictures. 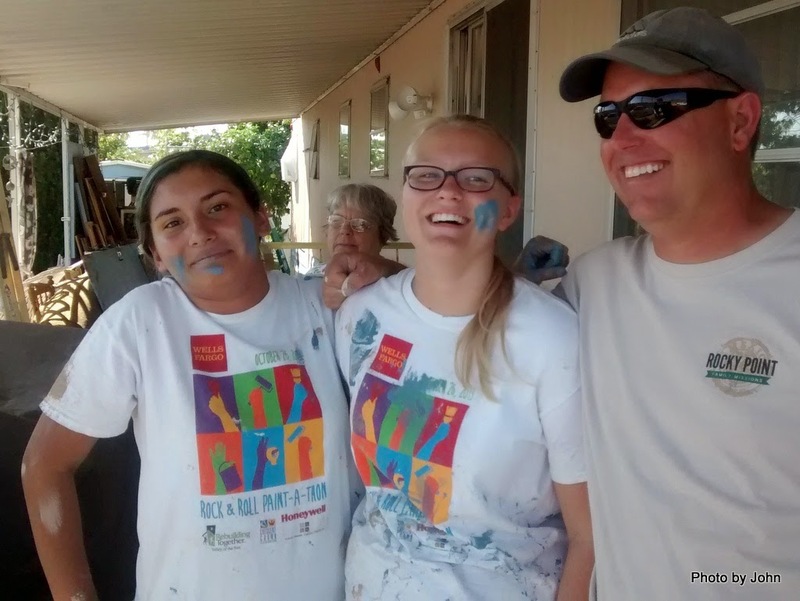 I got a kick out of the gals - I think they got as much paint on themselves as they did on the house. I was pleased to learn about Rebuilding Together. I'm going to look into volunteering more often with our local affiliate. I came home from the quick Alaska trip to reports that the roof had leaked. It leaked once before in a big storm when the house was just a couple years old. 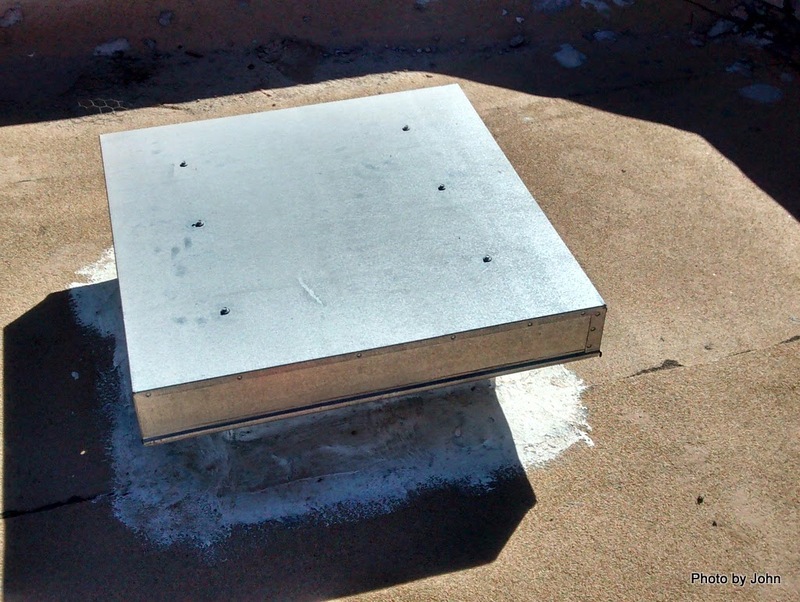 Once again, heavy rains accompanied by major winds was blamed, blowing rain under the vent cap and into the roof vent. I planned to deal with it after our Green River trip. Unfortunately, we came home to reports that the late September storm resulted in more leaks in the same place. 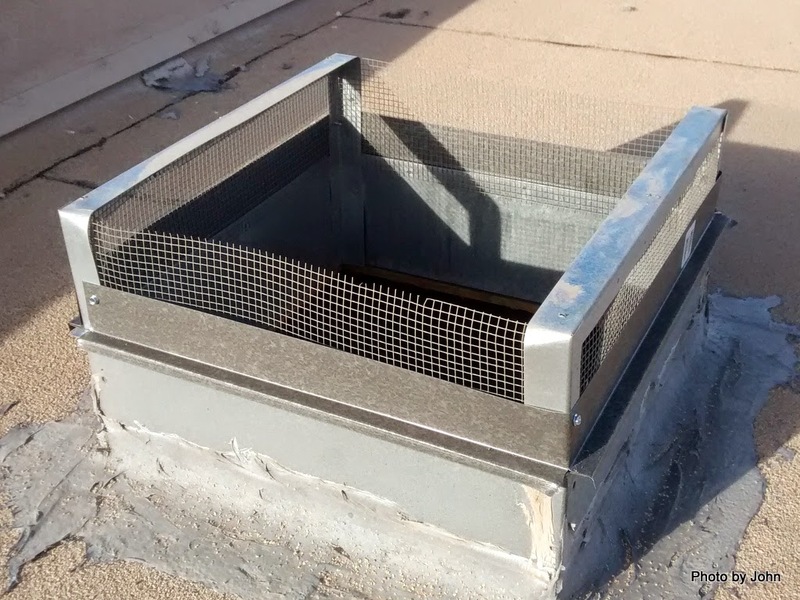 Roofer number 1 said the roof was still in excellent condition but that the vents needed to be lowered to create more coverage from horizontal rain. 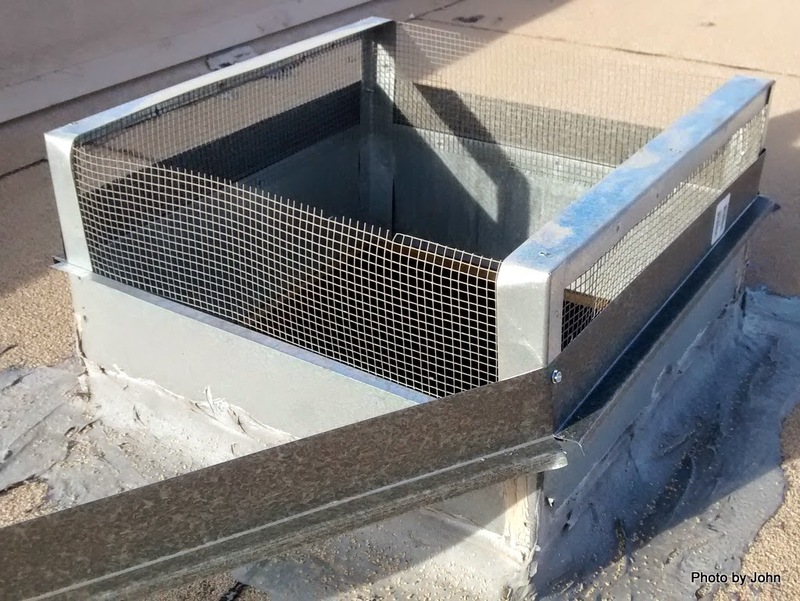 After removing the cap on the first vent, it was immediately clear that it would be much easier to blank the lower portion of the screen instead of cutting down and lowering the support structure. Roofer number 2 (I called four for quotes, had to wait two weeks to get the second quote and never heard back from the other two) also said the roof was in excellent shape for its age and that the vent mod that I'd done on all 14 vents was excellent. 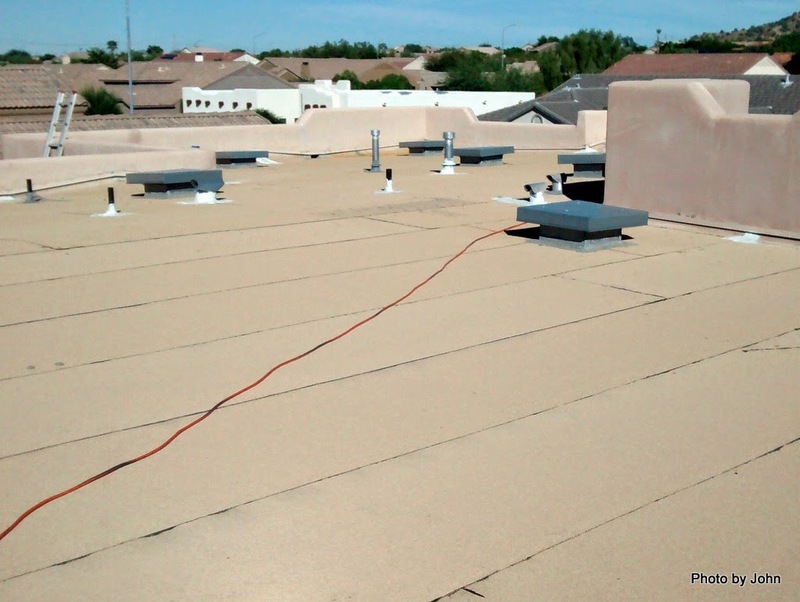 Both roofers were willing to install a foam roof system, but didn't feel it was necessary. Instead, I cleaned the roof, and I'm going to apply two coats of an elastomeric coating that has a 15 year warranty. There are lots of choices, but I'm going with Black Jack Maxx Cool for a number of reasons. 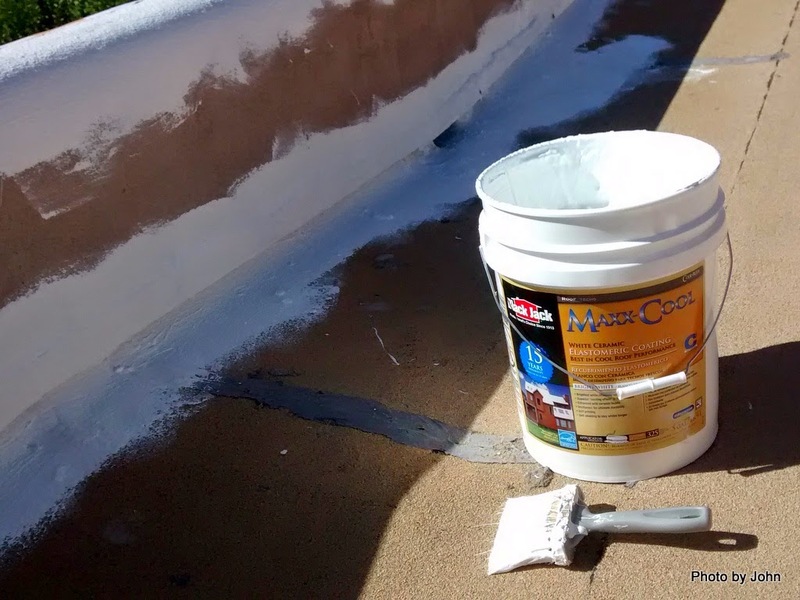 We're starting the project with 100 gallons of coating, but since we're applying it to the tops and backs of all the low parapets, I'm almost certainly will have to buy more. I got started, working the caps, corner, and edges with the brush, starting with the patio roof. The major sections will be rolled, but... the weather is still hot enough that it can only be applied in the mornings. I was hoping for cooler next week, but now the reports include chances of rain. Meanwhile, friends I haven't met yet are having a wonderful time in Utah. If it wasn't for the roof, I'd be prone to hook up and run north. Instead I just read Suzanne's, Jim & Gayle's, and Mark's blogs about all the beauty that we're missing. I'm unabashedly swiping a mod concept from Jon Vermilye. He copied the concept from someone else. Simply put, the concept is to cover the refrigerator doors with a laminated photo. Our refrigerator is a two door Dometic 6.0 cubic foot unit with the hinges on the right side of the doors. Given my love of rivers and canyons, I made it a point to take some vertical format pictures on our latest Green River trip. I've cropped them to match the ratio of the refrigerator and added a brown strip of the correct scale to represent the space between the upper and lower doors. I added three pictures at the end from March's Grand Canyon trip but I'm not sure that the last two will have enough resolution for this project. Please vote for the photo you think I should use by leaving a comment on this post. With a trip that was twice as long as most of our Green River trips, we did experience some equipment issues. We had three tents that leaked. 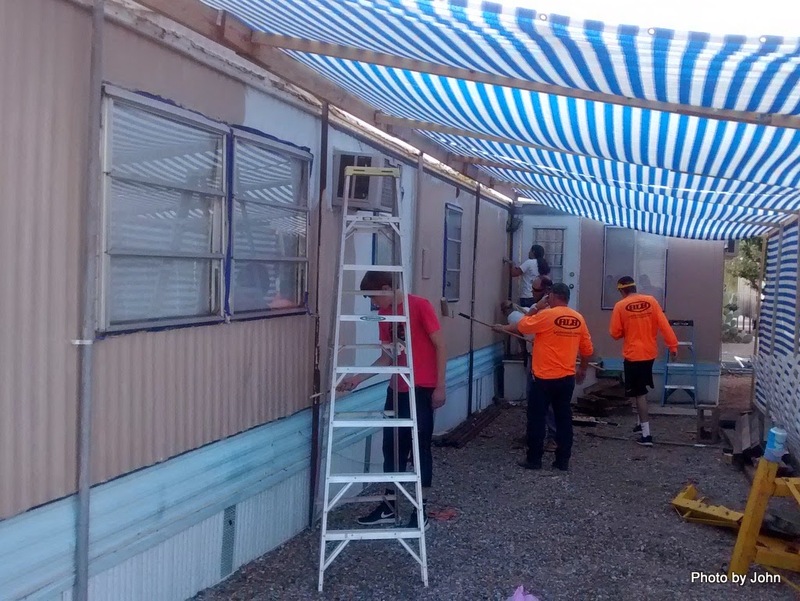 BJ's leaks were due to areas that should have been seam sealed, and I think that was true of the other tent leaks as well. My Big Agnes tent suffered from zipper issues. It has a very light weight zipper in the tent body that needed to be adjusted about every third day. The tent is at the manufacturer now for evaluation and possible zipper replacement. BJ's boots have been a fixture on the river for a number of years. This year one of the boots split. It was a tight crack - letting in water but still keeping the mud out. These boots have been retired and replaced by a new pair from Tractor Supply. The new ones are black boots with polka-dots. Not sure if switching from white to black boots is the same as switching from white hats to black hats. I guess time will tell. Alan's mattress got torn near the end of the trip, apparently on a rivet in his kayak. I had an old repair kit but the glue was old and didn't work. 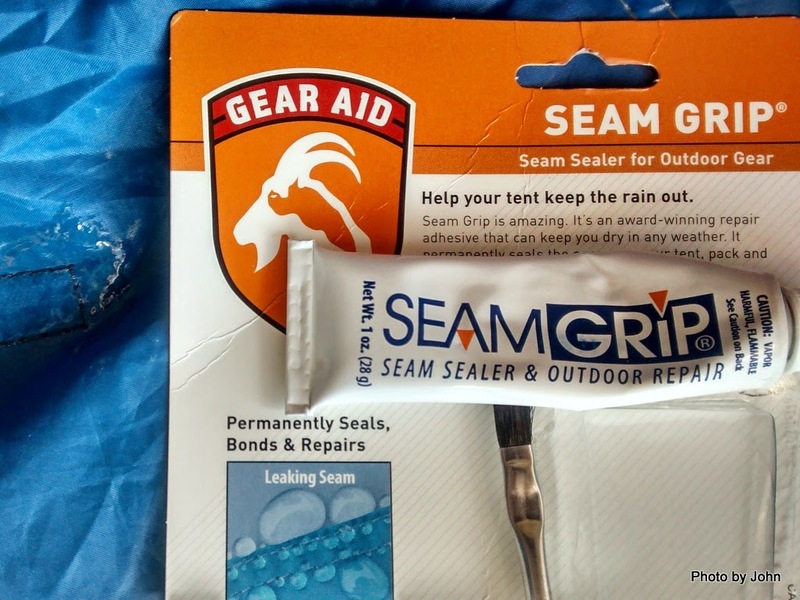 Future river trips will have a tube of Seam Grip, a tube of Zip Care, and a box of Tear-Aid Type A added to our repair kit. Amazing what you can do with this stuff. 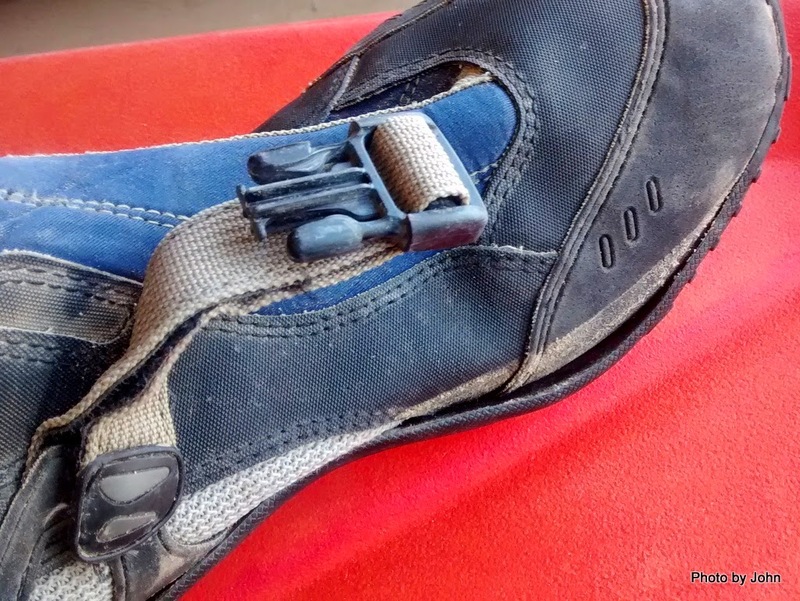 My NRS Attack boots have been a favorite but have been discontinued. They typically fail about year four in the same place my current pair started to come apart. I've re-glued them with some old Shoe Goo. We'll see if it works. 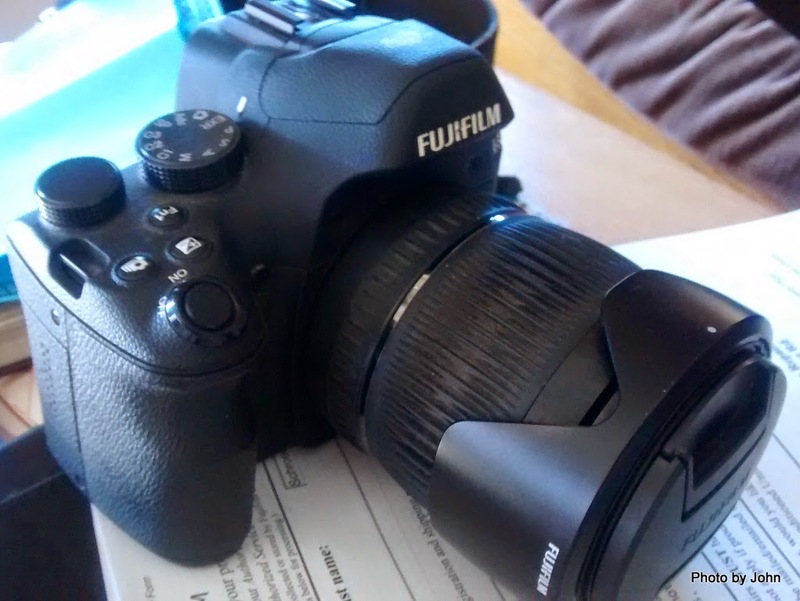 Finally, my Fujifilm X-S1 is on its way back to New Jersey. The second element in the lens has a small crack right in the center. It shows up as a dark area in the middle of wide angle pictures. It's still under warranty so we'll see how good the warranty is. Speaking of warranty, the lid handle on our several year old GSI cookset broke on the trip. BJ found replacement lids on their website but no shops carry them. A phone call resulted in an immediate "we'll send you a new lid - no charge" response." We've always liked their gear, now we're really impressed with the company. Alan used RunKeeper on his iPhone to keep a GPS track of our travels. 53 miles by van to Ruby Ranch from Moab; 99 river miles paddling & drifting; 50 miles by jet boat up the Colorado; 20 miles by bus back to Tex's in Moab; the whole experience - priceless! Once the boats were loaded at Tex's the group split up with Ian & Beth headed to Salt Lake City and points northwest. The rest of us headed to the Red Rock Lodge for hot showers and then went out for our last supper as a group. It was nice to have Kelli & Bryan join us. 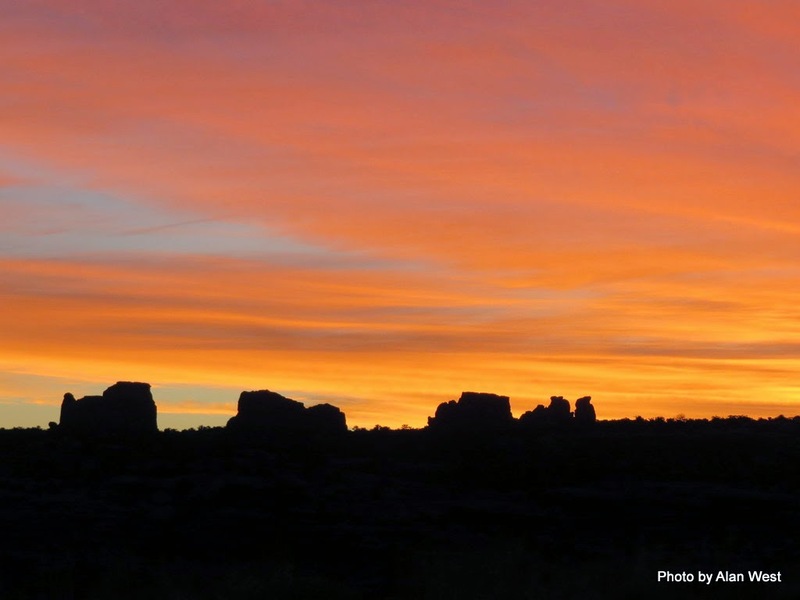 The next morning, John headed towards family in Colorado and Alan drove out to Canyonlands for one last look before heading back to his family and job in the Salt Lake City area. The rest of us got some breakfast at the Moab Diner and then headed out for the long drive home. I spotted Bluff, Utah's new signs on our way north and stopped to get a picture on our way south. It's not every American town that can claim to be established in 650 A.D. There are some beautiful ruins and petroglyph panels on the San Juan river in this area. We stopped by the BLM Sand Island campground and boat ramp to show Kathy the large petroglyph panel there. (Turn right as you enter the campground.) It's a huge panel with lots of different markings, sometimes layers of them. The campground has 24 spaces, $10, no reservations. I'm especially enamored with this one. Not sure if it represents a really strong person portaging three canoes or if it's a boondocking blogger looking for a better cell signal. Once again, Monument Valley tantalizes us. We really do need to come back and spend some time there. The Cameron Trading Post usually times out about right for a lunch stop on our return trip. 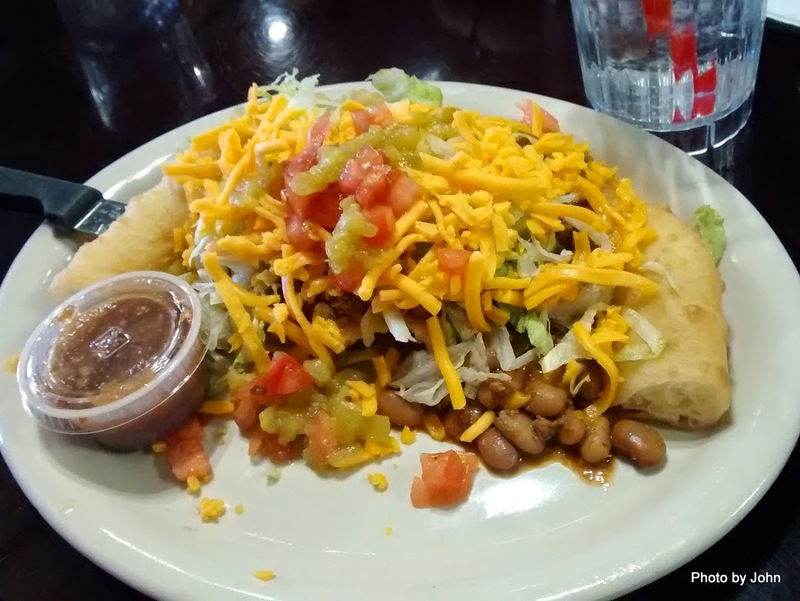 A couple folks shared a Navajo taco. I went for the excellent green chili stew that comes with a side of fry bread. Didn't get a picture - I was hungry! 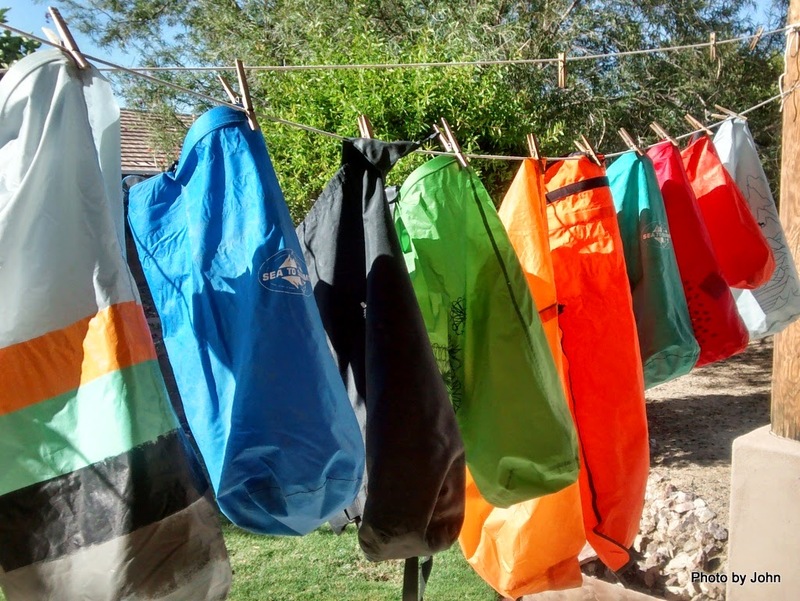 A lineup of dry bags cleaned and on the line to dry signifies the end of this trip. Not sure where we'll be off to next. A big thanks to the crew at Tex's Riverways in Moab who did such a great job with the shuttles, and to our friends both new and old who made the trip so memorable. As day broke, the sun started peaking over the east rim, slowly but surely lighting the cliffs on the western side of the Colorado river. At first I thought I was the first person to get up but then I realized John had the end of his tent open and was lying there watching nature's light show. At Mineral Bottom we'd met a kayaker from San Diego who brought a plastic kayak on the trip because "the Green River is too rough on wooden boats." Sure didn't seem that way to us! I think this is the 6th trip for the canoe. While I was taking pictures, I realized John was as well. It was great having both John and Alan on this trip with their eye for good photos. We all enjoyed both brothers. It's not very often that they get a chance to spend significant time together, so this trip was special to both of them. Two wonderful guys with very different experiences and great love for one another. Tex's jet boat had waved as they went south. They always start with the group furthest down river, so in this case they picked up the group that passed us late yesterday afternoon first. Also on board was our daughter and son-in-law who didn't have enough vacation time to do the whole trip so they made a long weekend of it in Moab and rode the jet boat both directions. The loading process moved quickly. All our bags of gear loaded first and then they started with the boats, saving the two short boats for last. Tex's always runs their big boat with a crew of two which makes loading go much faster than when a boat has just one crew member. This year Andy and Kenny were on the boat. With one more stop to go, they temporarily loaded Kathy's boat just ahead of the cockpit. Because we were on the Colorado below the confluence with the Green, PFDs were required by law. Our gear was on board and we boarded with clean feet by 11:30 a.m., heading up the Colorado for the last pickup of the day. The last group of the day was five people with two canoes and a sea kayak on a low sandbar. 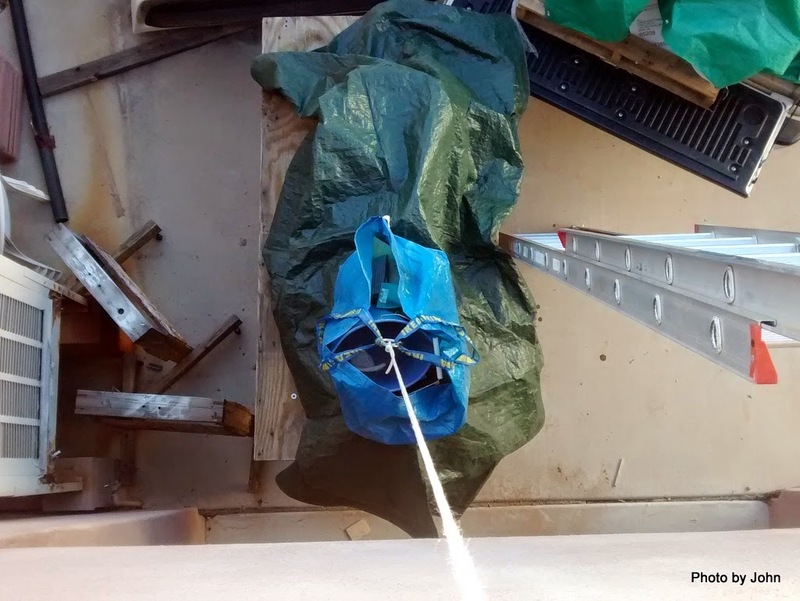 Once the canoes were loaded on the rack, Kathy's kayak was moved on top of them. All along the Colorado were beautiful, constantly changing vistas. 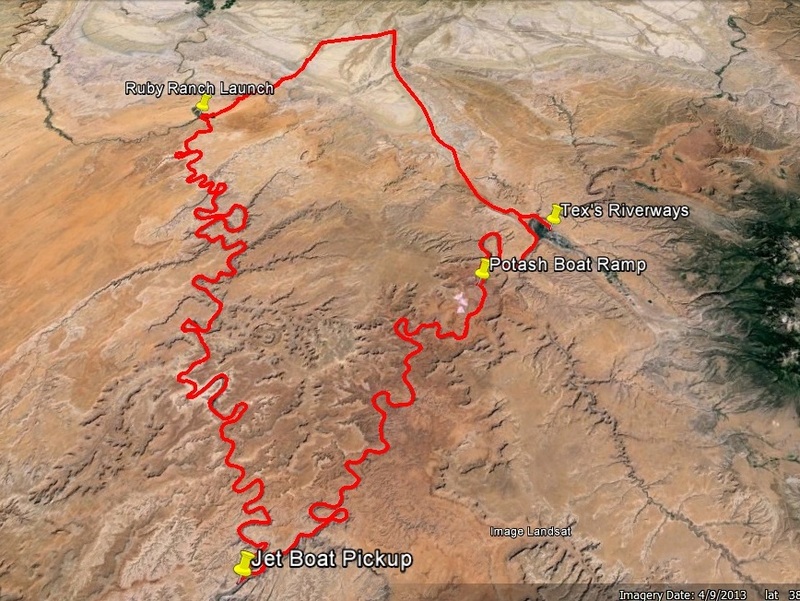 For us, the jet boat ride up the Colorado River side of Canyonlands National Park is a logical culmination of our trip down the Green River side of the park. Paddlers and rowers tend to watch out for one another. Kenny asked for donations of any left over coffee to help out a raft trip headed for the whitewater of Cataract Canyon below Spanish Bottom. At the Potash boat ramp, the 21 clients disembarked, Andy backed the trailer into the water, and Kenny blasted the boat onto the trailer. We all boarded our yellow limo for the remaining 20 mile drive back to Tex's office, arriving there about 3 p.m. Many hands make light work. 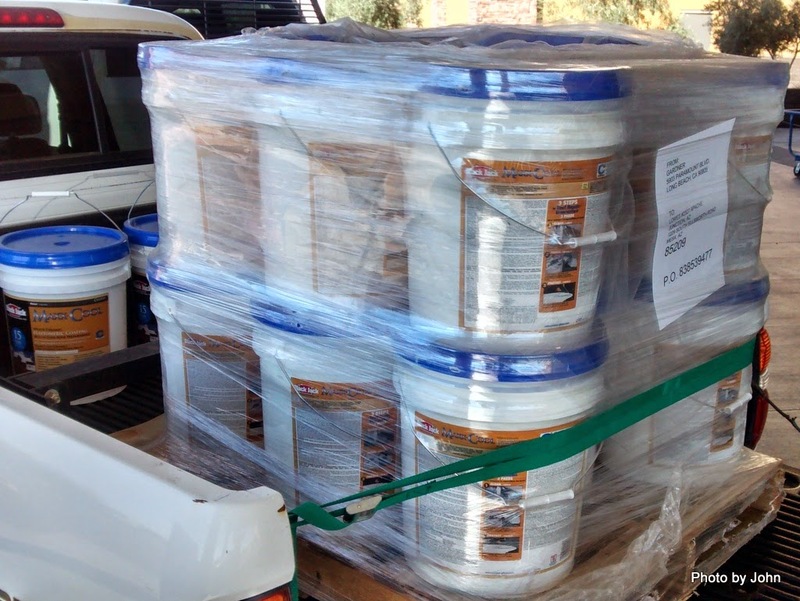 With all of the Tex crew working at unloading gear and boats from the jet boat, and all the clients carrying gear away, it didn't take long to get our boats and gear loaded onto our personal vehicles. The 48 miles from the confluence to the Potash boat ramp goes much faster that our paddling progress. Even with the stop to pick up an additional party, and a stop at Lathrop Canyon to use the restroom, we were back to hard surfaced roads in less than three hours. We spotted four separate raft groups as we traveled up the Colorado. 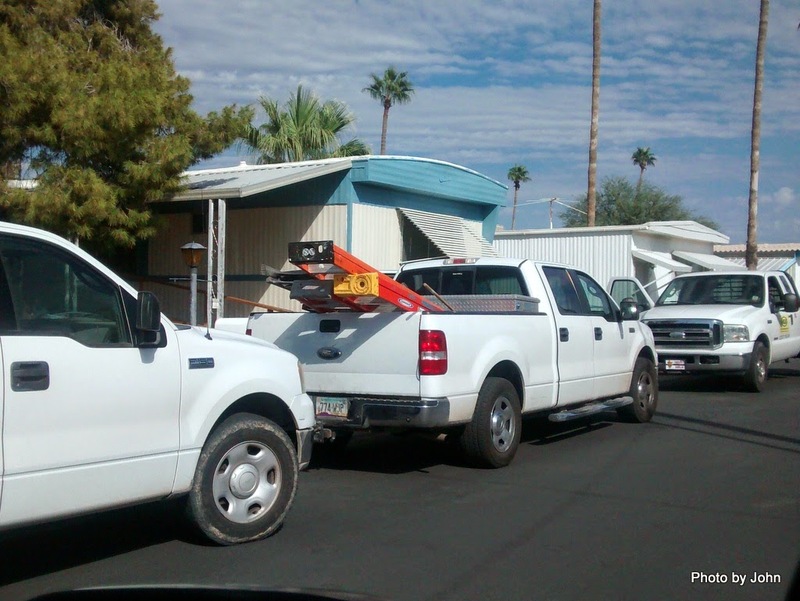 It appeared that they were all headed for Cataract Canyon and Lake Powell. Once again, a wonderful trip. The same, and yet so different from previous years.